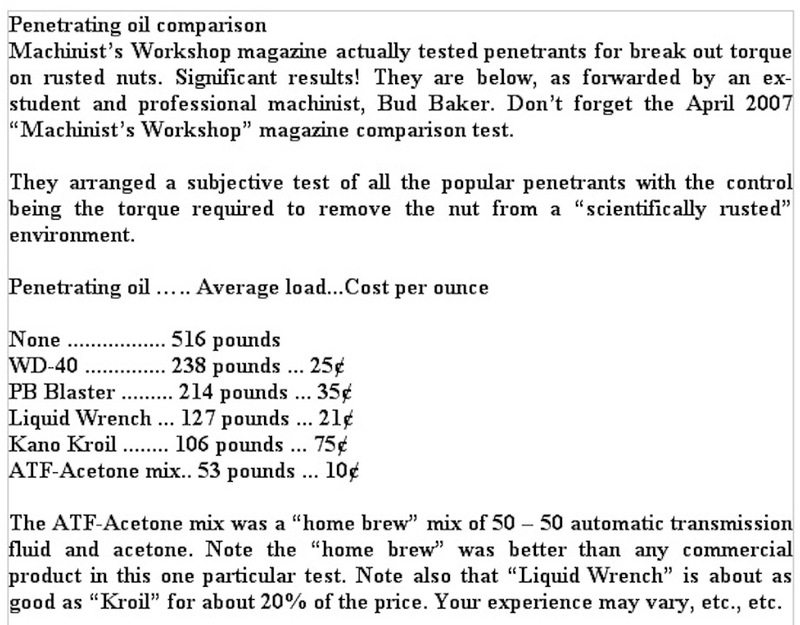 Model T Ford Forum: A little OT - Does penetrating oil actually work? A little OT - Does penetrating oil actually work? Model T Ford Forum: Forum 2014: A little OT - Does penetrating oil actually work? Just one of my random thoughts here. I've always had people suggest that I use penetrating oil, of all different brands, on rusty and/or stuck parts. Even so, I have yet to see definitive proof that it actually helps out of all the times I have used it. To me, resorting to penetrating oil is similar to declaring that all hope is lost and that it's time to resort to drastic measures. Does anyone out there have evidence that it actually works? Maybe I'm just doing something wrong? I pre-soak rusty fasteners, and I THINK it helps. If nothing else, it makes me feel better! I do notice that once you can get the pieces to move, they move much easier with the oil than without it. And I'm a great fan of Kroil! I once had very delicate part off a 1965 Ford (just got my first Model T four days ago) I needed to disassemble. I tried everything I could think of without breaking the part. Finally I soaked it with Kroil and put it on shelf for safekeeping and then promptly forgot about it. When I came across it by accident six months later, it unscrewed by hand. I'm sure it does work. Even the old "Penetrene" that my father used to use in the 60's and 70's, freed up lots of stuff over the years. He'd just give it a good soaking and leave it for a few days, maybe a week and it always worked. 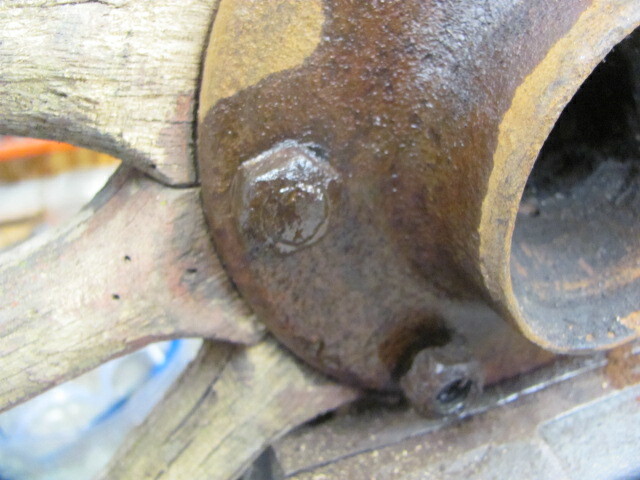 There is a real advantage to using penetrating oils, (not WD-40!, Heavens to Betsy, that is no help on rusted parts). The comment is....sometimes penetrating oil does the work. Let ,em soak and then rusted hub nuts would come off. Or sometimes not, as the upper hub bolts shows, it fractured with the nut stuck on the bolt....but the other nuts came off. There are some things you can do to help penetrating oil do it's job. 1,if there is no crevice,hole or crack for it to go thru,it cant help you as easy or as quickly. So I sandblast or other wise clean the areas of something tough to take apart so when I dose it with Kroil it will get in there quicker. 2, vibration helps.I think even your cans will say so. Lightly tap stuff to help it get in places that are tight. 3, Use the best penetrating oil you have FIRST. If you dumped WD-40 on it first, most other penetrants are going to be wasted as the wd-40 is just a damn to hold it back from going in. 4, Take your time. It didnt rust together overnight,and if you intend to save it, it aint coming apart overnight. My experience has always been good with Kroil. For many years I used Liquid wrench. But I think the past couple years it has yielded to the environmental nutcases and is not as good as it was since it is commonly available to the consumer. Kroil is really meant for the commercial market. So it is still good stuff. Kroil has saved alot of parts over the years for me. Sometimes if something is rusted soild,wont move, I can brush it a bit,spray it with kroil,and tap it a few times and work it gently with a wrench and it will come loose no problem. I find some of the parts that DONT come loose like this were cross threaded years ago and would not be helped by anything. Mechanical parts froze together,kroil is the stuff along with a light brass hammer to tap things around. Some 35 years ago I used a penetrating oil from the parts store across the street. It was called, "Nuts Off". Really. At the same time there was a lady that came around about every 3 weeks selling for an automotive chemical company. I bought a lot of stuff from her and we became friends. I was single then and she would ask me to take her out once in a while, usually dinner, she often paid the bill. Anyway, she knew I'd run across the street and buy some Nuts Off when I was out of penetrating oil, but I also bought her brand from her too. One day as we were making up an order she asked me if I wanted to also get some of her penetrating oil or if I wanted to get my Nuts Off across the street. I didn't flinch and she didn't either. I don't think she realized what she had said. I have been using 50% cheap ATF mixed with 50% Acetone for about 15 years. I would not use anything else. I have got a few other mechanics hooked on the mixture too. I was restoring an old MG TD for a garbage truck driver about 3 years ago. I used the mixture on his old car. He later told me that where he worked the mechanics ALWAYS broke the bolts that hold some bracket on the engine block when the try to remove the bracket for some other repairs or maintenance. He thought the bolts were just too far into the block. They also got water spray from foul weather or radiator overflow, or something, I forget most of the details. Anyway, he got one mechanic to try it and they said that was the first time one of those brackets was removed without breaking the bolts off. The guys loved it, but when they told the shop foreman about it they said they had to open some kind of account to buy the ATF and another for the Acetone, since they were not using regular ATF or Acetone in the shop. But at least for a while the mechanics were bringing in their own just to save themselves from drilling out the long bolts that always otherwise broke off. Now they spry the bolts with the mixture whenever they are servicing the trucks to avoid any break-offs. I read somewhere that steel/iron expands 27 times when it turns to rust, so that's why severely rusted parts are so hard to get out. convertible. Now it seems LQ is not as strong as it used to be. I am a fan of Kroil. But, patience is the key. Also, Kroil does a super job of getting the stubborn lead/copper out of my rifle barrels. It is amazing to see the patch turn green instead of just black. Inquiring minds need to know; Aaron, did you ever... (buy her dinner)? This thread from a few months ago covers some of my tricks, although I did forget to mention vibration, etc. Lightly tapping on a bolt or screw head, or very gentle application of an impact driver. An air, electric or cordless impact driver set to a very low setting, and just sit there and let it go tappa tappa for a while, including clockwise a few times, will sometimes help get things loose. A buddy and I were at a swap meet, when we got into a conversation with a guy selling a product called Strong Arm. Whenever we asked him what makes his product better than other penetrating oils, his response was, "It's science, man." (Direct quote, I kid you not.) He also said "The Strong Arm doesn't eat the rust. The rust eats the Strong Arm." (Another direct quote.) We did buy some, because we were curious. I like that it's a thicker oil, so it helps to lubricate parts as they come apart. Other than that, I'm not sure it's any better or worse than anything else out there. My grandpa has found a product called Free All. I'm not sure who makes it, but it's been the best stuff we've found. I would like to give the ATF/Acetone mix a try. Is it a 50/50 blend, or is there a different ratio? 50/50 is it. It'll make you throw rocks at anything else you've been using. 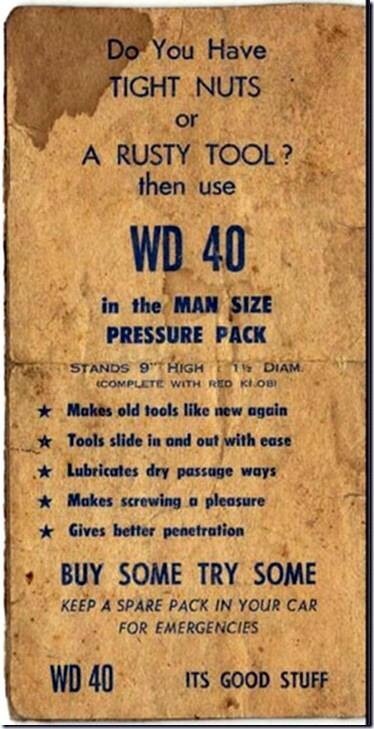 I don't know, this old '50's WD40 ad makes it sound like some pretty useful stuff. Yes guys, she really did sat that. Inquiring minds don't need to know. She was a very nice lady who spoke about her boyfriend once in a while. I took that as a message to keep it business-like and behave. The sign Paul posted above: I think it is a joke made in the last 10 years or so. Makes old tools.... Give me a break. WD 40 is one of the most over rated chemicals ever but it is good for drying your distributor cap. I've found that WD40 and similar products are pretty much useless and cost about $10 a can. There is a string of Asian discount stores that have a "Gun oil" at about $1.50 a can and it works just as well (as a lubricant spray). Heating nuts cherry red does wonders but it is not always safe, subject to where parts are. Sacrificing nuts with a nut splitter can be a handy alternative ? Don't know about everybody else, but I always hit rusty old bolts/nuts with a torch...causes the bolt/nut metal to expand and cracks the rust loose, never had it fail. the part to creep. I'll get back to see what happened over nite. If it works I buy a case of it. I am tired and am not going to read all of this post.It's almost midnite and I have had no nap today. I DO feel that the subject IS important though. FYI. Years ago there WAS a real product that WORKED!!!!! called KW Knocker Loose. This stuff WORKED!!!!! It was banned because (I think) it contained Carbon Tetrachloride!! What I do and have done for years is to get yourself an old drum. Fill it half full of auto transmission fluid. Trans shops are glad to get rid of it. 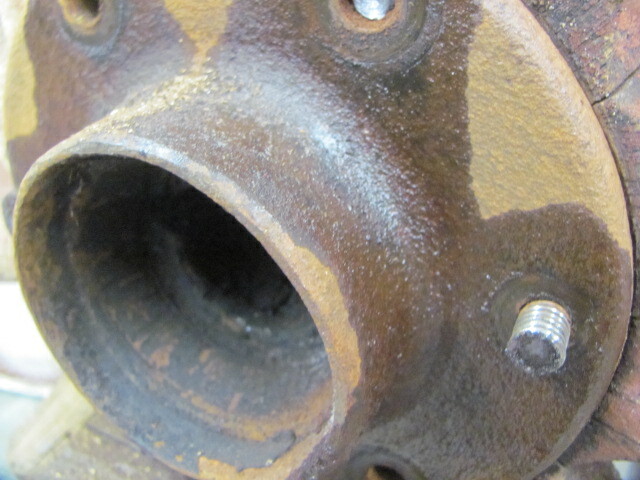 Clean by scraping off most dirt and debris off of old rusty engine blocks (T's) and submerge them into the trans fluid. Soak for about 3-4 days. Then remove the engine and you'll be pleasantly surprised how effective this works. I could not believe it when told by an OLD mechanic in the 70's. So if it works on old rusty engines then it should work on other things as well. I usually don't take the time to soak everything that comes into my shop. I use heat from the oxy/acet. torch and paraffin from a candle then let it cool. I saw a photo of someone's T wheel nuts on the hub. I use the torch here and work the nuts back and forth or just grind off the threaded bolt end then disassemble the hub bolts (6). These are usual peened over by owners who got tired of loose hubs. Or maybe this was done in Mfgring. ??? Anyway they will not loosen with any penetrating oil. You need to replace these bolts and nuts with new when respoking your wheels. It is tough today finding exact replacement wheel hub bolts. China would do it if you bought enough. In the 1000's. Nope, not hard to find them at all. RV Anderson has them. Grade 5, I believe.